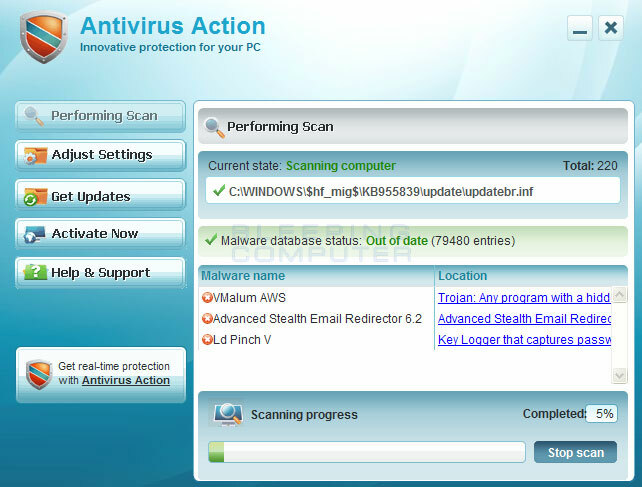 Antivirus Action is a fake security program from the same family as Security Suite. This rogue is installed on your computer through computer infections and fake anti-malware scanners. When malware installs this infection it is commonly through exploit kits that attempt to install and execute files on your computer by exploiting a variety of exploits that may be available on your computer or through the software that you run. If an exploitable program is found it will then install and execute the Trojan that will ultimately download and install Antivirus Action on to your computer. When Antivirus Action is installed it will be configured to start automatically when you login into your Windows account. Once started it will scan your computer and state that there are numerous infections, but will not remove any of them unless you purchase the program. This is a scam as the infections it states reside on your computer do not actually exist. They are only stating that there are infections to scare you into purchasing the program. Application cannot be executed. The file notepad.exe is infected. Do you want to activate your antivirus software now. Antivirus Action terminates your programs for two reasons. The first is to protect itself from an infected user running a security program that may be able to remove it. The other reason is to further scare you into thinking that your computer has a serious computer infection so that you will then purchase Antivirus Action. Just like the fake scan results, these security alerts are all false and are only being shown to scare you. This Internet Explorer hijack is false as well and just another tactic where the developers are trying to convince you that your computer is infected. It is important to note, though, that when you terminate or remove the Antivirus Action process, your browser will no longer work until you disable the configured proxy server. The guide below will walk you through removing the proxy server. Without a doubt, Antivirus Action was created for one reason; to scare you into thinking your computer is severely infected so that you will then purchase the program. It goes without saying that you should definitely not purchase Antivirus Action, and if you already have, please contact your credit card company and state that the program is a computer infection and a scam and that you would like to dispute the charge. To remove this infection and related malware, please follow the steps in the guide below. %Temp% refers to the Windows Temp folder. By default, this is C:\Windows\Temp for Windows 95/98/ME, C:\DOCUMENTS AND SETTINGS\ProfileName\LOCAL SETTINGS\Temp for Windows 2000/XP, and C:\Users\ProfileName\AppData\Local\Temp for Windows Vista and Windows 7. Print out these instructions as we may need to close every window that is open later in the fix. 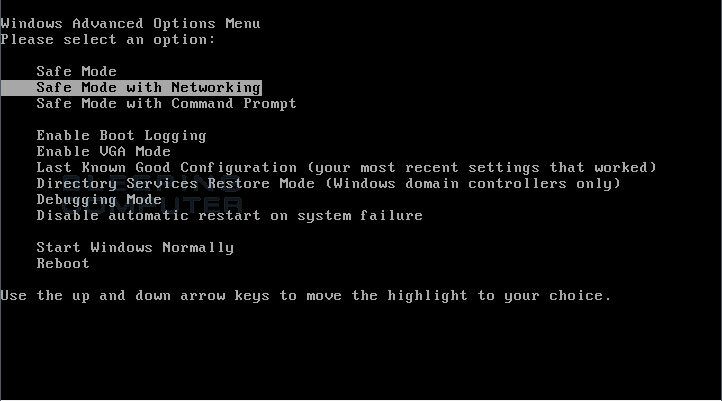 Windows will now boot into safe mode with networking and prompt you to login as a user. Please login as the same user you were previously logged in with in the normal Windows mode. Then proceed with the rest of the steps. It is possible that the infection you are trying to remove will not allow you to download files on the infected computer. If this is the case, then you will need to download the files requested in this guide on another computer and then transfer them to the infected computer. You can transfer the files via a CD/DVD, external drive, or USB flash drive. iExplore.exe in order to automatically attempt to stop any processes associated with Antivirus Action and other Rogue programs. Please be patient while the program looks for various malware programs and ends them. When it has finished, the black window will automatically close and you can continue with the next step. If you get a message that RKill is an infection, do not be concerned. This message is just a fake warning given by Antivirus Action when it terminates programs that may potentially remove it. If you run into these infections warnings that close RKill, a trick is to leave the warning on the screen and then run RKill again. By not closing the warning, this typically will allow you to bypass the malware trying to protect itself so that RKill can terminate Antivirus Action . So, please try running RKill until the malware is no longer running. You will then be able to proceed with the rest of the guide. Do not reboot your computer after running RKill as the malware programs will start again. If you continue having problems running RKill, you can download the other renamed versions of RKill from the RKill download page. Both of these files are renamed copies of RKill, which you can try instead. Please note that the download page will open in a new browser window or tab. Once downloaded, close all programs and Windows on your computer, including this one. Double-click on the icon on your desktop named mbam-setup.exe. This will start the installation of MBAM onto your computer. When the installation begins, keep following the prompts in order to continue with the installation process. Do not make any changes to default settings and when the program has finished installing, make sure you leave both the Update Malwarebytes’ Anti-Malware and Launch Malwarebytes’ Anti-Malware checked. Then click on the Finish button. If MalwareBytes’ prompts you to reboot, please do not do so. MBAM will now automatically start and you will see a message stating that you should update the program before performing a scan. As MBAM will automatically update itself after the install, you can press the OK button to close that box and you will now be at the main program as shown below. On the Scanner tab, make sure the the Perform full scan option is selected and then click on the Scan button to start scanning your computer for Antivirus Action related files. MBAM will now start scanning your computer for malware. This process can take quite a while, so we suggest you go and do something else and periodically check on the status of the scan. When MBAM is scanning it will look like the image below. When the scan is finished a message box will appear as shown in the image below. You should click on the OK button to close the message box and continue with the Antivirus Action removal process. You will now be back at the main Scanner screen. At this point you should click on the Show Results button. A screen displaying all the malware that the program found will be shown as seen in the image below. Please note that the infections found may be different than what is shown in the image. You should now click on the Remove Selected button to remove all the listed malware. MBAM will now delete all of the files and registry keys and add them to the programs quarantine. When removing the files, MBAM may require a reboot in order to remove some of them. If it displays a message stating that it needs to reboot, please allow it to do so. Once your computer has rebooted, and you are logged in, please continue with the rest of the steps. When MBAM has finished removing the malware, it will open the scan log and display it in Notepad. Review the log as desired, and then close the Notepad window. You can now exit the MBAM program. When the file has finished downloading, double-click on the hosts-perm.bat file that is now on your desktop. If Windows asks if you if you are sure you want to run it, please allow it to run. Once it starts you will see a small black window that opens and then quickly goes away. This is normal and is nothing to be worried about. You should now be able to access your HOSTS file. We now need to delete the C:\Windows\System32\Drivers\etc\HOSTS file. Once it is deleted, download the following HOSTS file that corresponds to your version of Windows and save it in the C:\Windows\System32\Drivers\etc folder. If the contents of the HOSTS file opens in your browser when you click on a link below then right-click on the appropriate link and select Save Target As…, if in Internet Explorer, or Save Link As.., if in Firefox, to download the file. Your Windows HOSTS file should now be back to the default one from when Windows was first installed. As many rogues and other malware are installed through vulnerabilities found in out-dated and insecure programs, it is strongly suggested that you use Secunia PSI to scan for vulnerable programs on your computer. Google Search Results Redirected? It is a Virus!